The Fjallraven Greenland Pants are cut like a pair classic five-pocket button fly jeans but with some new materials "G-100 Echo" 65% polyester/35% cotton and the addition of a leg pocket. These heavy duty jeans are designed to be used for everyday wear as well as for outdoor activities. The website describes these as having a button fly, but the ones I receive have a zipper fly and button closure. I ordered the product based on my normal size (US 36) and found the pants to fit quite snug, so I had to order a larger size (US 37) which seem to fit well. These only come in one inseam length so I will have to get them hemmed. Going over the pants, I found the stitching to be very tight and of good quality with no flaws or defects that I could see. The material looks and feels very durable. The details like pocket corners and belt loops appear to be well stitched with double and triple stitching in key stress areas. The buttons and snap appear to be of high quality and are firmly attached. 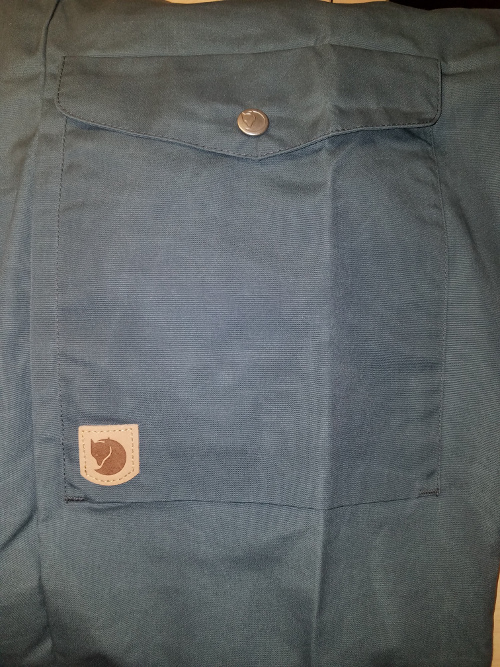 On the inside of the pants, on the right front pocket is printed in multiple languages instructions for treating these with wax for adding water resistance. Fjallraven offers their own "Greenland" wax for adding water resistance to materials, made from a mix of paraffin and bees wax. I don't have a lot I can add regarding their look beyond the product description of them being a standard five pocket jean with the additional leg pocket. The leg pocket seems to be in a good location, low enough to not interfere with flexibility while high enough to be easy for me to reach all the way to the bottom. One of the things I like best about gear testing is when my expectations do not match the reality of a product and this is one of those cases. 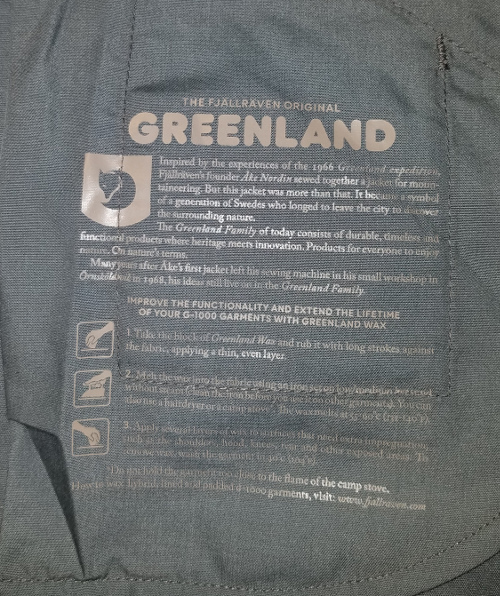 I want to say the Fjallraven Greenland pants don’t fit well, are too stiff, too heavy, and being cotton are unsuited to back country travel…I want to say all that, but I can’t. The fit of these pants are rather different from any jeans I have ever worn, and while it took me a bit to get used to it, I have to say they are really comfortable. Comfortable enough to sleep in, which I have done. They are loose (bordering on baggy) where they need to be (in the seat, around the knees, etc), to allow for free movement during my hiking and everyday activities, and yet they fit where they should. Also the thickness of the material plus the tight weave make them great when encountering sharp rocks/branches, and even thorns. I have experienced scratches and cuts through my normal thin hiking pants, but these pants are more like a form or armor when it comes to some of the trail hazards I encounter. 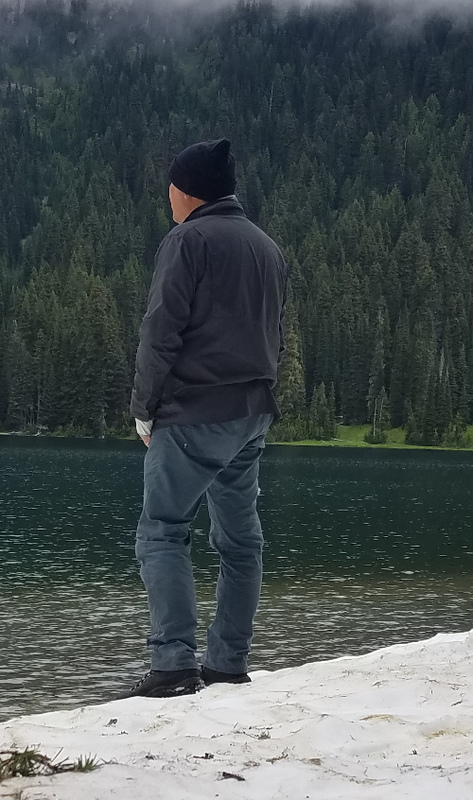 While these pants are thicker and heavier than what I normally wear for hiking, I am finding them to be quite wind resistant helping me stay warm while still breathable so they are not as hot as I would have expected. The added weight has been totally unnoticeable and offset by the features. I want to say the leg pocket being in the front rather than the side of the leg is annoying and results in any large object in the pocket (e.g. my phone) rubbing while I walk as I expected it to, but again I can’t. Now that I have used these, I am finding that placement to work quite well and is easy to access regardless of if I am standing or sitting, and is quite comfortable even with a heavy item like my phone. I want to repeat the common phrase “Cotton Kills” but at least in regards to these pants can’t really say that for sure either. 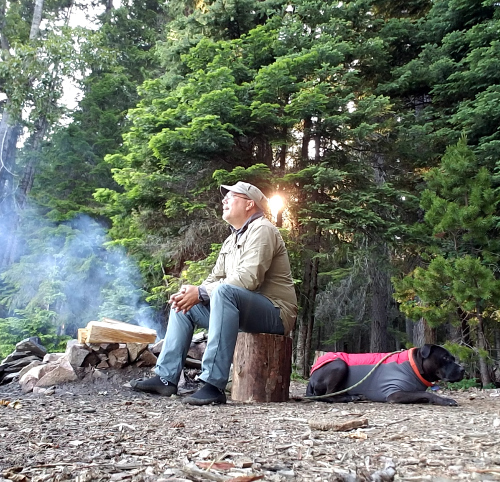 During my first overnight with the pants, while I did not encounter any rain, I was camped by a lake, and between normal camp chores and playing with my dog I did manage to spill/splash water on the pants a few times. Much of the water simply ran off and some soaked in, but they seemed to dry rather quickly (more quickly than I would expect from a cotton blend), and as evening came on with a cold breeze while I had to put on a long sleeve shirt and puffy, my legs stayed quite warm protected by only these pants. I will note that I have worn 5 pocket jeans from a few manufacturers and one common factor I have found is that the small watch pocket is more cosmetic than functional. I am finding the watch pocket in the Greenland jeans to be looser and maybe larger, making them totally functional and it works quite well for my keys, making them easier to access as well as keeping them separate from the other objects in my pocket (which more often than not primarily consists of dog treats). Between my first and second overnight outing with these pants I purchased some of the Fallraven Greenland wax and applied it per the instructions printed in the pants. I found it more difficult than I had expected to apply the wax. The block was hard and I had to use significant force to get what I thought was an adequate amount of the wax on the material, and in the process had to deal with the material wrinkling constantly. I would note that it was rather cool in the room during the application (~73F/23C) and I plan to try treating the pants again after warming the wax some. I used a standard hair drying to melt the wax into the material and when I was done could not really see any visible difference. But this is not a review of the wax so this is just some additional information. On my second overnight trip, I did not notice any significant difference in regards to warmth or wind resistance of the material. I did not manage to get the pants wet, despite all the snow, so I am not sure yet how effective this treatment was in regards to water resistance. Since the Field Report I have worn these pants on one more weekend family camping trip as well as continued to wear it for my normal daily actives including to the office and working around the house and yard. I also wore them for two CPR classes that I taught and our annual Ski Patrol refresher, which sounds insignificant but it is worthy of mention. The annual refresher is held at the ski resort and we spend a lot of time sitting, getting up and down off the floor wile being or taking care of simulated patents. While much of this is indoors we end up spending some time outdoors and the conditions can variety greatly(rain, wind, snow, mud, etc), I never know what to expect. These pants are so comfortable regardless of what I am doing and work for such a wide range of conditions that these were the first thing I thought of when assembling my gear for the refresher. I would also note that as I write this I am preparing to go to my office for some night work, and just happen to be wearing the Greenland Jeans. 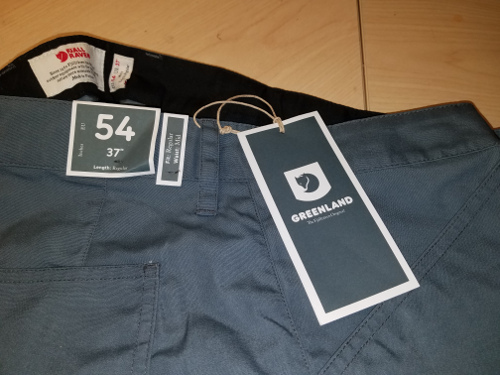 I will also be going to Puerto Vallarta Mexico in a few days and plan to wear my Greenland Jeans for the flight as they will be warm enough for the trip to the Portland airport while also not too hot for the long drive from the Puerto Vallarta airport to our hotel. In conclusion I would say these Jeans totally turned my definition of Jeans on its head. I never though I would say these words but I am looking forward to Nordic ski and snowshoe in Jeans! And I expect to be purchasing more of these in the near future. This concludes my report. I would like to thank the folks at FJALLRAVEN and BackpackGearTest.org for the opportunity to test this product, and invite you back in 2 months for the next installment of this report.